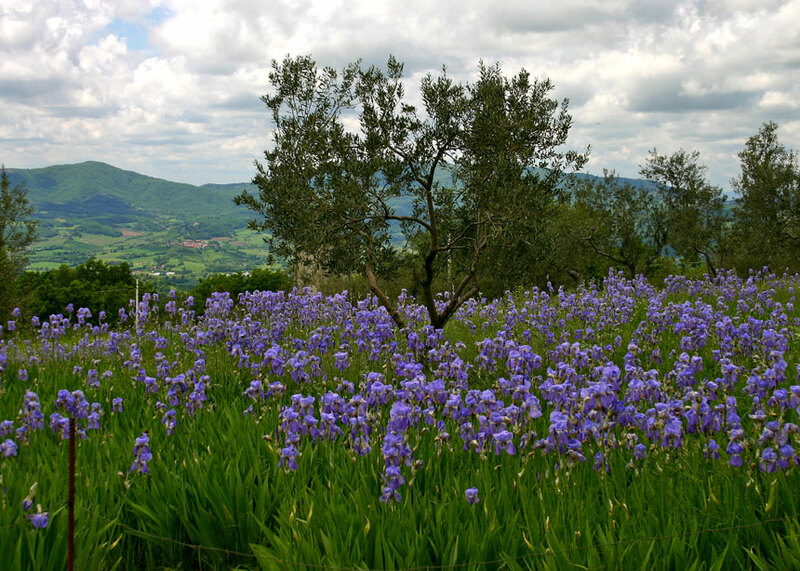 The grape-scented, lavender-blue iris known as I. pallida ‘Dalmatica’ has been used in perfumery and distillery since ancient times, and it’s still being farmed for that purpose today — as seen in the photo below taken in Tuscany by our good customer Debbie Hughes of Wellsville, Kansas. 4½ pounds of a thick, oily, and very expensive substance known as orris butter which is still widely used in making high-end fragrances — and gin. “The pharmacy and perfumery of Santa Maria Novella, established by Dominican friars in Florence in 1221, gained notoriety for its use of the rhizomes of iris. They were not the first — Greek and Roman writings mention it — but their perfumes, cordials, and powders contained liberal doses of this rare and precious substance. “Orris was popular not so much for its fragrance — although it does contain a compound called irone that gives it a faint violet smell — but as a fixative, holding other fragrances or flavors in place by contributing a missing atom that would otherwise make the fragrance volatile and easily released from the solution it is suspended in. “None of this chemistry was understood at first. Perfumers and distillers would also not have understood why the rhizomes had to dry for two to three years before they become effective as a fixative. We now know that it takes that long for a slow oxidation process to occur, bringing about the chemical change that causes irone to form from other organic compounds present in the rhizome. “Only about 173 acres of orris are cultivated worldwide. Most of the orris is either I. pallida ‘Dalmatica’, grown in Italy, or . . . I. germanica var. Florentina, grown in Morocco, China, and India. I. germanica ‘Albicans’ is also used in orris production. “To extract the orris, the rhizome must first be pulverized and steam-distilled to produce a waxy substance called orris butter, or beurre d’iris. Then alcohol is used to extract an absolute, which is a perfumer’s term for a stronger version of an essential oil.